I don’t know how you feel but last Friday was wild. I was very proud of the competitive hockey being played and good sportsmanship on and off the ice. Let’s look into what went down Friday and see if anything I predicted/foreshadowed was correct. Next up we had absolute thriller at CIA. Some people called this an upset. That’s simply untrue. It wasn’t. I wrote last week that progressively throughout their three matchup’s that River Ridge played East Lake better and better each game. I knew Demitri Samarkos would not be held scoreless in this game. Which is why I made a key of the game to stop him. In the opening sequence of the second period, he had his team’s first goal of the game. He was able to get another in third less than a minute after River Ridge’s Dylan Hultberg converted on a penalty shot and also had 4 four points on the night. River Ridge played a complete game. Daniel McCarthy was huge in net. The kid was an absolute brick wall stopping 26 of 28 shots. To me, the biggest variable in the Knights’ win was out shooting in every period. They were aggressive all game and at one point on the kill, they strung together 6 shots. They didn’t give Anthony Samarkos, or the Eagles defense a chance. East Lake is a great group. Their season is not over, they will move on to States at the end of the month but their opportunity to claim the Lightning Cup is over. River Ridge takes on Steinbrenner this Wednesday at 7:30 @ FHCI. Folks feel free to call me a fortune teller. I encourage it actually. I told you the West Manatee v Durant game was going to be close. If you listened to the podcast I not only said this game was going to overtime but I told you how many goals were going to be scored. This was a very clean game. Only one penalty per team but when Durant got their chance, they were able to get the opening goal of the game. Kirill Shpak was able to get West Manatee on the board in the second and we were all knotted up headed into the third. Eric Bowles was able to give the Cougars the lead again and once again, West Manatee was playing catch up. Ten minutes later, Tyson Nutten was able to help his brother Tristian out who stopped 11 or 13 shots on the night. 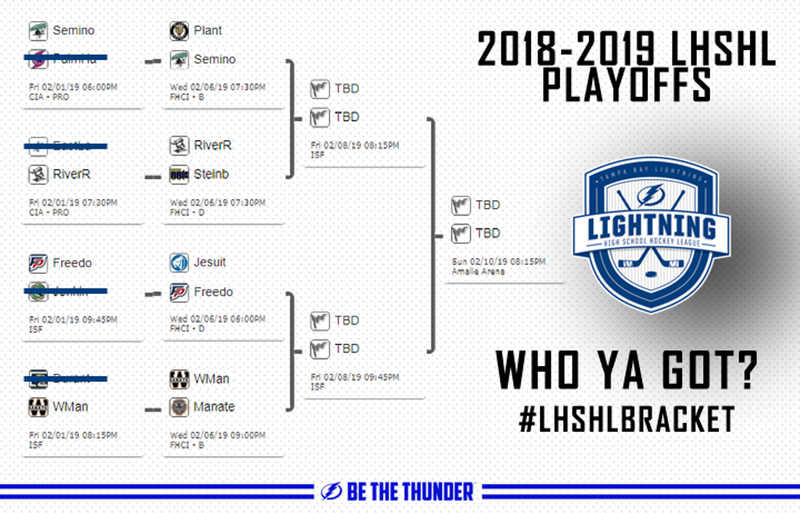 But when the Friday Night Lights became the brightest, Mate Imre answered the call and buried the OT winner for his team sending them to the next round where they will take on defending Lightning Cup champs, East Manatee Wednesday night at 9:00PM over on Rink-D at FHCI. For the final game of the first round of the playoffs, we had Freedom and Jenkins. Freedom was the victor and like I said, if Freedom was going to win this game and go on a playoff run, they had to get back to playing the Freedom brand of hockey that powered them during the beginning of the season. Jenkins was able to keep Owen Barno off the scoreboard for the entire first period and nearly all of the second. By placing emphasis and eliminating Barno, Jenkins was unable to contain nor stop sophomore star, Matthew Speciale who had a special night. He had not one, not two, but seven points. Four goals and three helpers on the night. Folks, like I said in the first game. Don’t just look at the scoreboard, read the scoresheet. This game was 4-3 near the end of the 2nd before the Patriots put it out of reach. Jenkins’ Keaton Clay had a remarkable night. Clay had a hatty and two of his goals were shorthanded against a very good goalie in Matthew Garneau, defense, and team. Freedom advances to the next round where they will take on Jesuit. Now it’s time to get into this week’s matchups! All games in the second round will be played at Florida Hospital Center Ice. First up we have Jesuit taking on Freedom. A matchup between two Andreychuk rivals. Early on in the year, I wouldn’t have doubted you for thinking Freedom was going to run away with the division. After a stellar second half of the season, Jesuit was able to go on a run and steal the division from the Patriots. At the end of the regular season. Only Jesuit four points separated the two teams. Here’s a little fun fact, my first ever LHSHL game was between Freedom and Jesuit. Freedom had a convincing 8-0 win, but they would go on to play each other two more times and I think it’s safe to say Jesuit came back harder and more prepared. In game 2 Freedom won but the score was 5-3. The third time they played back in November, Jesuit came out on top, 7-5. Both of these teams have high powered offenses with players such as, Owen Barno and Josh Burke. The matchup in net is similar but different with good goalies but different in age. Both Freedom goalies, Jacob Sanders and Matthew Garneau both being upperclassmen and both Jesuit goalies, Nathan Hyde and Charles Garon are freshman. Know where Barno is. If you’re going to shut down Barno, know where Matthew Speciale is. He lit up Jenkins last Friday. Stay out of the box. Jesuit will make you pay for you mistakes. Next up we have River Ridge and Steinbrenner. River Ridge is coming in hot folks. They had their biggest win of the year last week and Steinbrenner must be aware of that. I spoke to a Steinbrenner player who will remain anonymous at the game last week and I asked him who he would rather play and guess what. He said River Ridge and now that is a reality. Both of these teams are loaded from top to bottom. I genuinely can’t spot a weakness. Special teams may be where they differ the most. Both teams are hovering around 90% on the PK but Steinbrenner’s powerplay is successful 22.6% of the time whereas River Ridge is converting 7.8% of the time. The biggest advantage is that the Knights were in action the last few weeks while Steinbrenner hasn’t played a game since January 18th. Steinbrenner did actually play the Fr/So EDP team last week where they fell behind 2-0 early but were able to eke out the victory with strong performances by Colin Anna and Kyle Ciaccio. People will gravitate towards picking Steinbrenner to win this game. I’m warning you right now, the same thing happened last week and look what River Ridge was able to do. This game is going to be very close. Attack, attack, and attack. This team does not give up many goals. Know where #11, #73, and #93 are at all times. Do what you do in the 1st period. You outscore opponents 37 to 10. Keep it up. At 7:30 PM on Rink – B we have Seminole taking on Plant. I am going to put my streak on the line. This game is going to overtime. These two teams are balanced. Another matchup that is loaded from top to bottom. These two teams have faced off three times this year. Seminole won two of those three. I said it before, I’ll say it again. These two teams are close in just about every category. From PK- PP to GF-GA. They have talented goaltenders. My biggest matchup between the two will be once again, Nathan Norris vs. Matthew Brkljacic. You have got to stop Norris when he carries it into the zone because the kid makes plays and if he gets in front of your net. Good luck moving him. I did this last week with Durant and West Manatee and I’m doing it now. I don’t have keys for this one. This game is the most balanced of night. Last but certainly not least, we have a battle of the two Manatee’s. These two teams faced of twice this season with East Manatee getting the W in both games and outscored West Manatee 14-5. As we all know, East Manatee is the reigning Lighting Cup Champions. Players like Connor Nicholson, Tyler Stowe, and Nathan Bennett have been here before and will score goals at will if they are clicking on all cylinders. But this isn’t all about East Manatee. West Manatee is once again…The hottest team in this league. They have had player and goalie of the month honors given to Oliver Appleyard and Tristian Nutten. They would love to upset their fellow “County-men” tonight.